Cause of Death: Shot in the eyes with exploding darts by Dart II causing his head to explode. Powers: Flight, heat and flame generation. FirePower was one of the freaks within the Vicious Circle that resented OverLord running them as a merciless dictator. He carried out a failed assassination that ended with his neck being broken by his intended victim. FirePower would not be seen again for some years but returned following the defeat of CyberFace, a man whom he had become deeply devoted to over the years. sent by OverLord III to steal Dragon’s blood from Hillman Hospital. This theft led to the creation of the ill-fated Dragon Army. FirePower was amongst the Vicious Circle members present that rejected OverLord’s leadership, refusing to give up their criminal ways. FirePower along with Crippler later decide to rob a bank together. 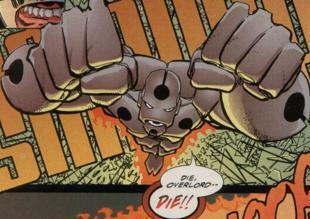 However, FirePower is quickly knocked out as OverLord crashes into the bank and flies head first into FirePower. FirePower later becomes the leader of the Vicious Circle and banishes Powerhouse and Flash Mercury from Chicago as the two don’t share the current goals of the Vicious Circle. His empire is slowly picked to pieces by Dart II who wants to assume control of the Vicious Circle. This leads to a confrontation between the two which results in FirePower’s death during the duel.